This is what a Virgin Galactic supersonic flight with the SpaceShipTwo looks like, up close and personal. It's not quite space, but it's still damn gorgeous to watch. 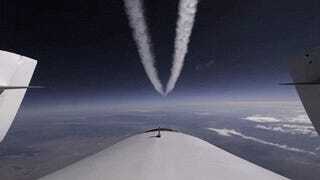 Virgin Galactic conducted its second supersonic test flight over the Mojave desert. After being released from the WhiteKnightTwo mothership at 42,000 feet, SpaceShipTwo fired a column of flames from the engine before reaching an altitude of 69,000 feet. And they got the whole thing on tape. This second test bodes well for Richard Branson's little startup that could. The hybrid engine burned for 20 full seconds, four more than the lasts test flight, and everything went smoothly as it tilted its wings up into "feather mode" for the descent back to Earth. The spacecraft ultimately reached a top speed of Mach 1.6, the fastest yet. Branson couldn't be more excited. "This is a giant step," the billionaire wrote on his blog. "Our spaceship is now the highest commercial winged vehicle in history!"